How do I set up eStatements for my RCU account or my Visa account? Save time and trees with eStatements. It's easy to get started, highly secure, and simple to use. Best of all, it's free! Please sign on to RCU Online banking and click on the Statements tab, then Statements Preferences link. To receive eStatements as your delivery preference, please select the eStatement button next to your account and click Next. Please make sure the information is correct and click Confirm Changes. 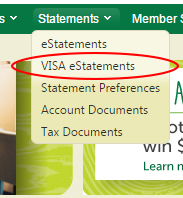 If you recently enrolled in Visa eStatements it will only show statements from the time you signed up. Once you have opted in to Visa eStatements you can view your statements by clicking on the Statements tab, then VISA eStatements link. When will my eStatement be available for the previous month? I can't view my eStatement. How do I view my eStatement? I'm logged in to RCU Online banking. Why can't I view my eStatements? How do I view VISA credit card eStatements? Where can I view my eStatements in RCU Online banking? Is Redwood Credit Union a "green" company?